A parliamentary report of 1777 recorded a workhouse in operation at Ludlow Town for up to 40 inmates. In 1835, the workhouse was on Upper Gaolford (now Galdeford) with Samuel Oliver as its master. A property known as Lane's House, on Old Street, Ludlow, is also said to have been used as workhouse from the 1670s until 1837. A house at the southern end of Leintwardine once served as the parish poorhouse. County of Salop: Abdon, Ashford Bowdler, Ashford Carbonell, Bitterley (2), Bromfield, Caynham, Clee St Margaret, Cold Weston, Culmington, Diddlebury, Halford, Holdgate, Hope Bagot, Hopton Cangeford, Ludlow (5), Munslow, Onibury, Richard's Castle (part of), Stanton Lacy (2), Stoke St Heath, Stoke St Milborough, Stokesay, Tugford. County of Hereford: Aston or Pipe Aston, Burrington, Downton, Elton, Leinthall Starkes, Leintwardine North Side, Richard's Castle (part of), Wigmore. Counties of of Salop and Hereford: Ludford. Later Additions: East Hamlet (from 1884), Ludlow Castle (1862-1901). The population falling within the union at the 1831 census had been 17,476 with parishes ranging in size from Cold Weston (population 25) to the Ludlow itself (5,252). The average annual poor-rate expenditure for the period 1833-35 had been £6,972 or 8s.0d. per head of the population. Initially, it seems that the Ludlow Guardians were considering a plan for the conversion of the Leintwardine parish poorhouse into a workhouse for the union. 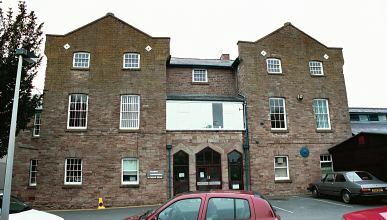 However, a new union workhouse was built in 1836 at the junction of New Road and Gravel Hill in Ludlow. The Poor Law Commissioners authorised an expenditure of £5,000 on construction of the building which was to accommodate 250 inmates. The architect was Matthew Stead and his design was based on the model cruciform or "square" plan published by the Commissioners in 1835. The workhouse location and layout are shown on the 1901 map below. An entrance and administrative block lay at the south, behind which four accommodation ranges radiated from a central hub. Between the arms of the cross, separate exercise yards were created for the various classes inmates (infirm/able-bodied, male/female, etc.) with the north-east and south-east yards being divided by diagonal walls. Ludlow entrance block from the south, 2001. A casual ward was erected at the east of the entrance block. Ludlow casual ward and rear of main block from the north-east, 2001. A separate building at the south-west of the workhouse may have been a school block. Ludlow school(?) block from the east, 2001. After 1930, the workhouse became a Public Assistance Institution then, in 1948, joined the National Health Service as East Hamlet Hospital. The surviving buildings now form part of Ludlow Hospital. Shropshire Archives, Castle Gates, Shrewsbury, Shropshire SY1 2AQ. Please note that records may contain gaps or have access restrictions - please check before visiting. Holdings include Guardians' minute books (1836-92, 1896-1930); Admissions and discharges (1846-81, 1890-94, 1900-08, 1911-13); Births (1836-1944); Deaths (1837-66); Creed register (1869-1906); Punishment book (1842-1912).